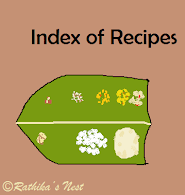 Rava idly is a popular breakfast item, that can be made in a short notice. This idly can be made without much effort. Rava idly goes well with a spicy chutney. Note: The ingredients mentioned here make approximately 20 idlies. However, the number of idlies depends on the size of the idly mould you use. Method: Roast rava in a kadai until the it starts turning golden brown in color. Allow it to cool. Mix roasted rava, urad dhal powder, ground pepper and asafoetida well in a vessel. Add curds and required quantity of water. Mix well. Add more water if needed to make the batter into pouring consistency (like the regular idly batter). Heat oil or ghee in a tadka pan/spice pan (தாளிக்கிற கரண்டி), add mustard seeds. Once they start to sputter add the dhals and jeera. Fry till the dhals start to turn golden brown. Add cashew nuts and saute for a few seconds. Switch off the fire and add the seasoning to the batter. Mix well. DO NOT allow the batter to stand and prepare idlies immediately. How to prepare idlies: Mix the batter well before using. Smear the idly moulds with sesame oil. Pour batter up to the brim in each mould. Pour 300ml of water in a pressure cooker or idly cooker. Steam the idlies for 5-7 minutes. Once the idlies are cooked, the steam will smell of idly flavor. Switch off the stove and remove the idly mould. Allow the idlies to cool for a minute or two. Remove the idlies from the mould and transfer to a hot case. Serve hot with chutney and sambar. How to make urad dhal flour: Roast urad dhal in a kadai till the dhal turns golden brown in color. Allow it to cool. Then grind the dhal using a dry grinder into a fine powder. Alternatively, you may grind the dhal in a neighborhood flour mill. Sieve the flour to remove any coarse particles. Store the urad dhal flour in an air tight container and use it when required.